Today I notified the President about my resignation. It is a though-out decision. Some phase of work is completed - we have adopted the budget and resolved the problems associated with the national airline "airBaltic", the situation in the country - stable, no difficult tasks are irresponsibly put on the shoulders of the next government. However, in order to successfully develop the state, the government has to be restarted. A lot of work has been done; now the time has come for new ideas and new leaders. During this time, we have successfully implemented the first Latvian Presidency of the Council of the European Union. We are still receiving high praise for it. 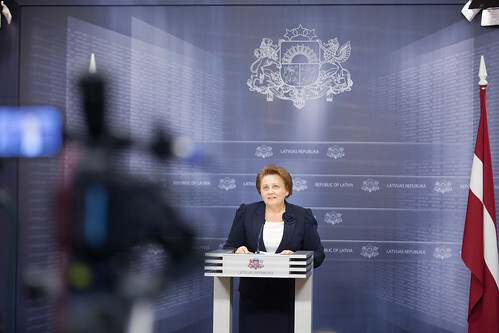 We have reduced the personal income tax; we have put into practice the indexation of pensions (in 2016, the pensions will be recalculated for the years when the pension capital index was negative), we have increased the minimum wage amounting to EUR 370 in 2016; we have provided support for families with children (measure "First Housing”; we have increased the amount of state benefit for the second and third child; we have reduced the patient fees, completed the liberalization of the electricity market by introducing the social support instruments, and for the first time after the crisis, the electricity price has been reduced; we have found solutions to retention of a fixed mandatory procurement component, as well as strengthened the regulatory framework for free competition of the Latvian natural gas market. In 2016, the differentiation of a non-taxable income, a solidarity tax will be introduced. These are only a few accomplishments. The development of the state is stable. Compared with Q3 of the last year, GDP has grown by 3.3 %, the unemployment rate has decreased, the average wage has increased by 7.3%, the investment has increased by 6.4%, and it is the steepest increase in investment since 2012. The national priorities include an efficient and sustainable tax policy (the 2017 budget should be developed based on a medium-term fiscal framework), adjustment of funding for higher education and research. Innovative economics requires an innovative foundation. The reform of teachers' salaries should be completed, keeping in mind the interest of people and not the interests of the schools. It is necessary to adjust health sector, including the redistribution of the social tax in favour of health funding, by gradually introducing mandatory health insurance. We have demonstrated that the government can work as a single team, without intrigues, shoulder to shoulder. I would like to thank the ministers, members of the Parliament and coalition partners for the joint work and both Presidents - for the support. My deepest gratitude goes to the electorate and my supporters who allowed me to continue work after the first government. A person who has demonstrated the ability to take responsibility, to keep calm and achieve a result in tough times could take over the work. In my opinion, it would be Minister for the Interior Rihards Kozlovskis. Latvia is more important to me than the posts and relationship. The path of each government ends sometimes. And it is good, because we are a democratic state. However, Latvia is the path that will never end! Video recording of the press conference.